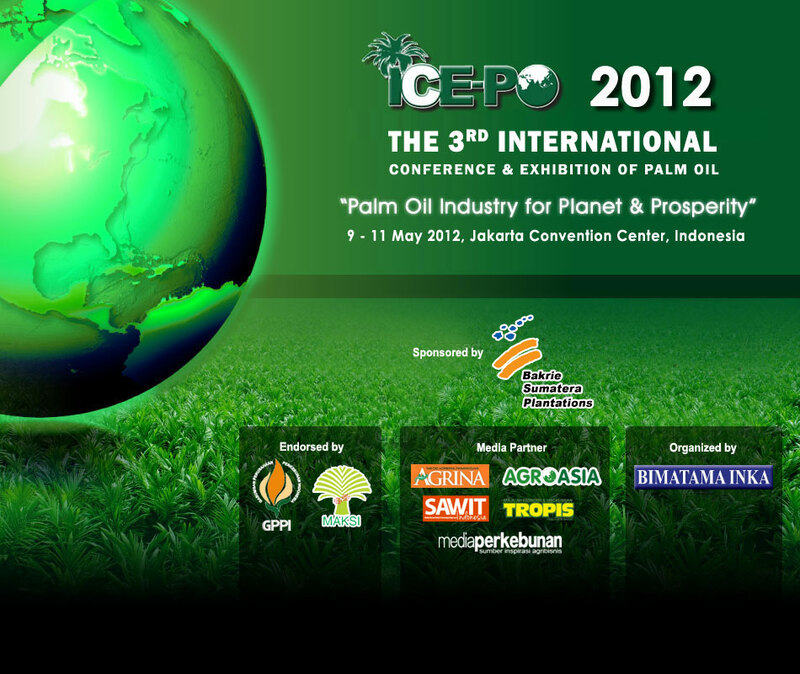 The International Conference & Exhibition on Palm Oil 2012 will be held in Jakarta Convention Center, Indonesia from 9 to 11 May 2012, in the capital city of Indonesia. The event is presented to you, to continue the success of ICEPO 2009 & 2011. The rapid growth of the palm oil industry in recent years has brought new opportunities and challenges into the world economy. These bring the need for a flat form to discuss strategies and to achieve more sustainable future business for the Industry. ICE-PO 2012 is aim to create a sustainable platform for the industry players to exchange information, ideas, and experience among producer and consumer on Palm Oil product, also provides a unique opportunity to review the advances in Palm Oil development, analyze and overcome challenges that the industry face today. The event itself is expected to be attended by 1000 conference participants and 5000 visitor. This is an annual seminar organized by the Center for Pulp and Paper, Ministry of Industry - Republic of Indonesia. For 2012, the seminar is expanded into an international scale. The symposium will be held in Bandung, Indonesia on November 20-22, 2012. In this symposium, the researchers and technical experts who are active in related fields, are invited as plenary and keynote speakers to enhance fruitful international exchange. In addition, this symposium also accept oral and poster presentations cencerning the research results and/or application from practitioners for more technical information and interactive discussion. Tour Bunaken will be organized on September 22nd 2012.
dr. Janno B. B. Bernadus, MBiomed. Prof. Dr. Lucia C. Mandey, MS. The upcoming Triple Helix 10th International Conference – 2012 (TH 2012) is the tenth in a series of biennial conferences that started sixteen years ago to consider the interaction between university/research institution, government, and industry, and its influence on the economic development of specific regions. TH 2012 will be organised by the Institut Teknologi Bandung (ITB) through its School Business of Management (SBM-ITB) together with the Ministry of Research and Technology (Ristek) and the Directorate General of Higher Education, the Ministry of Education and Culture, Indonesia (Dikti). 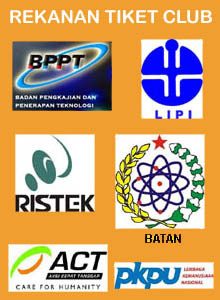 The Conference will be held in Bandung, West Java, from 08 to 10 August 2012. The main theme of the Conference is: “Emerging Triple Helix Models for Developing Countries: From Conceptualization to Implementation“, with attendant key theme of: (1) Strengthening National Innovation Policies in Developing Countries; (2) Building Infrastructure; (3) Success Stories in Enhancing the Relevance of the Triple Helix Model. The event will be held in the historical hotel of Grand Royal Panghegar Hotel, Bandung, and is expected to attract some of 400 international participants. TH 2012 offers an ideal place to learn of the latest aspects of triple helix innovation in developing countries, in particular, in the regions of South-East Asia (ASEAN Members), emerging industrial countries, as well as across the world. Authors are invited to submit Abstracts for the Conferences, through the website:http://th2012.org/ , where further instructions are available. Abstracts should include a paragraph on the importance of Triple Helix interactions and innovation for growth and economic success particularly for developing countries, and should identify the key themes associated with the paper. Please note for the closing date for submission of Abstracts is: 10 December 2011. For more information on manuscript submission, and other relevant information, please view the TH 2012 website at http://th2012.org/ . "Strengthening Research and Innovation in Chemical Sciences for Better Quality of Life"
This activity aims to discuss in depth various issues related to innovative governance. Various thoughts on this subject are expected to be contained. Expected at this seminar the speakers, lecturers, researchers, students and various other parties may meet and exchange ideas to discuss the challenges faced by public administration future. Venue: The International Seminar and Congress venue will take part in the Faculty of Administrative Science building on Jl. M.T Hayono 163, Malang, Indonesia. The seminar will consist of two-day intenational and national seminar, IAPA Annual Conference and a one-day city tour on the last day. The working languages during the congress and international seminar will be English and Indonesia. The participants can join city tour with an additional cost. The organizer will arrange one day tours into touristic spots nearby the conference place. Detailed information about these tours can be found in the conference website. The conference is open for college students, researchers, policy makers, and practitioners interested in issues related to Innovative governance. Participants can present their papers in discussion group (international parallel session or national parallel session), but it is also possible to attend without presenting a paper. Participants (presenter or non-presenter) can choose a group discussion according to interested topic, and as such the seminar will be an excellent opportunity to receive feedback on paper that presented and stay informed about trends and research agendas in the field. Fadel Muhammad is an Indonesian politician and businessman. He was appointed as the Governor of the then-newest Indonesian province, Gorontalo for the period 2001-2006. In 2006, he won the first Gorontalo gubernatorial election, making him governor until 2011. On October 22, 2009, he was chosen and inaugurated as the Minister of Maritime Affairs and Fisheries by President Susilo Bambang Yudhoyono. In 18 January 2011 he has selected vice president of PERSADI 2011-2015. Meredith A. Newman, Professor of Public Administration and Director of the School of Public Administration (Ph.D., Deakin University, Australia), has served in academia as the Chair of the Department of Public Administration, University of Illinois at Springfield and for nine years as a member of the public affairs faculty at Washington State University. Prior to her current career in academia, Dr. Newman served with the Australian Foreign Service (in France and Viet Nam), the U.S. Department of State (in Senegal, Malaysia, and Republic of Singapore) and the World Bank (in Washington DC and Dakar, Senegal). Professor Newman is widely published in the areas of public management, administrative theory, gender and worklife issues, human resources, and administrative ethics. Dr. Newman was elected vice president of ASPA in 2007. M. Shamsul Haque is Senior Lecturer Department of Political Science National University of Singapore and Deputy Editor of International Review of Administrative Sciences. He has a Ph.D. from University of Southern California. He is interested in diverse research and teaching areas, and believes in a multi-disciplinarity approach to knowlege construction and deconstruction. He has extensively published on development theory, public governance, public sector reform, ethics and accountability, policy and politics (privatization), environmental politics, globalization and the state, and other current issues. M.Irfan Islamy, is a Professor of Public Policy, Public Administration Department, Faculty of Administration Science, Brawijaya University. He was appointed as the associate deanIII Faculty of Public Administration Science. He has Master degree from University of Southern California in 1980 and Doctoral degree in sociology from Airlangga University. Professor Irfan has extensively published in the areas of public policy, actively research on social issues and writing scientific articles in various media. Eko Prasojo is a member of the steering committee within the executive council of theEastern Regional Organization of Public Administration (EROPA), chairman of the expert commission, Indonesian Association of Public Administration (IAPA) and member of theAsian Association for Public Administration (AAPA). He was a visiting scholar at the University of Freiburg (1998) and the graduate Research Institute for Policy Studies (GRIPS),Tokyo (2010). He published 15 books (in Indonesian language), several journals and presented papers in some international conferences and seminars. From 2003 - 2010 Eko Prasojo worked with the GTZ for the Ministry of Administrative Reform of the Republic of Indonesia, where he served and consulted some reform projects. Eko Prasojo was involved in several drafts of law on bureaucratic reform and decentralization in Indonesian. He is a member of the advisory council for local autonomy in Indonesia since 2006. Now he serves as a vice minister of Ministry of Administrative Reform and Bureaucratic Reform, Indonesia. His research interests include federalism and decentralization, democratization and local democracy, political economics in bureaucary, administrative reform, and public policy studies. Samrit Yossomsakdi is a professor of Public Administration at the Bhurapa University, Thailand. He earned his Masters in Public Administration at Chulalongkorn University, Thailand and Master of Political Science at the University of Saitama, Japan. He achieved a Ph.D. in Political Science at Northern Illinois University with a dissertation topic of "The Governance Structure of Thai Higher Education and the Policy-making Process in Formulating the National Development Plans with Respect to Higher Education Policies". Now he served as Dean of the Faculty of Social and Political Sciences, Bhurapa University, Thailand. Peran fungi dalam interaksinya dengan kehidupan manusia khususnya dan organisme lain pada umumnya, dewasa ini menjadi fokus perhatian penelitian. Berbagai bidang dalam disiplin ilmu Mikologi semakin berkembang, Hal ini menunjukkan bahwa Mikologi sangat diperlukan perannya dalam menjawab berbagai isu lokal maupun global. Dari sedemikian besarnya biodiversitas fungi, baru sebagian kecil di antaranya yang telah dikenal dan dimanfaatkan serta dinilai-tambahkan melalui upaya bioteknologi untuk kepentingan manusia. Seminar yang akan diselenggarakan dalam terang tema “Biodiversitas dan Bioteknologi Sumberdaya Hayati Fungi” ini secara luas akan membahas perkembangan Mikologi terkini dalam bidang ekologi fungi, mikologi pertanian, mikologi kesehatan, mikologi pangan serta perkembangan riset mikologi dan jejaring peneliti. Bidang terakhir tersebut di atas sengaja dimunculkan dengan tujuan untuk menggagas terbentuknya suatu wadah bagi para peneliti, pemerhati dan praktisi Mikologi yang semakin diperlukan partisipasinya dalam pembangunan Indonesia secara berkelanjutan. Direktur Budidaya dan Pascapanen Sayuran dan Tanaman Obat. Direktorat Jenderal Hortikultura, Kementerian Pertanian RI. Topik : Kebijakan Pengembangan Jamur. Prof. Dr. Ir. S.M. Widyastuti, M.Sc. Topik Sessi Pleno 1 : Peran Jamur dalam Kesehatan Hutan. Topik Sessi Pleno 2 : Perkembangan Riset Mikologi dan Jejaring Peneliti. Topik Sessi Pleno 3 : Aplikasi Cendawan untuk Pangan dan Kesehatan. Topik Sessi Pleno 4 : Potensi Budidaya Jamur di Indonesia, Tantangan dan Hambatannya.